A couple of years ago, I was honored to have heard a guest speaker talk a bit about his history and the background of the Bhutanese people, including their ongoing struggles. Bhim Magar, now a resident of Cedar Rapids, IA, is originally from Bhutan but most recently lived in Nepal. Magar, who came to the U.S. in 2011, currently works at St. Luke’s hospital as a Nepali translator. He was collecting donations for relief efforts to send for aid in Nepal after the 6.7 magnitude earthquake killed thousands and devastated many areas on April 25th, 2015. The Bhutanese refugees are Lhotshampas (“southerners”), a group of people of Nepalese origin. As they were deported from Bhutan in the 1990’s, these refuges registered to go to refugee camps in Nepal and many still live in these camps. Many of Nepali origin emigrated into Bhutan in the 1980’s, but did not assimilate into the culture as the government desired, which caused a growing perception that they were a threat to national unity. They were not allowed to take part in their own customs or to celebrate their culture, to the extent that the Nepali language was removed from the school curricula. There was a required dress and etiquette code to conform to the culture of the North, called a One Nation One People policy. To further enforce this, a census occurred in 1988 to determine if one was a citizen or illegal alien – if one could not provide proof of citizenship. The conflict continued to grow between the Lhotshampas and the Bhutanese government and ultimately, many people were persecuted and massacred. Although the refugees were descendants from Tibet, with history presenting that Bhutan was settled by people of Tibetan origins as early as 6th century, none will be given citizenship either in Tibet or in Nepal. Many of these refugees have and are in process of resettling in North America and Europe to find the freedom they were not allowed in Bhutan. Living in the United States, it is difficult to imagination true persecution. We (myself included!) complain about silly things – the weather, a perceived slight from someone while driving, nothing sounds good to eat for dinner. But those complaints mean that while someone may have cut me off, I have a vehicle and can get to work. Nothing sounds good to eat for dinner, but I have a fully stocked pantry. I may complain about the weather, but I work and live in buildings that have air conditioning to keep me cool in the summer and heat to warm me in the winter. We are a rich country, even those who may have to sacrifice and live without some of the more luxurious things in life. This is not to say there are not problems here – there are many homeless and hungry people throughout the United States and I am not dismissing this. The refugees are unable to work away from the camp, cannot farm since they don’t have land, so they rely on help from various world agencies. Their monthly food allotment is carefully rationed so there will be enough to last. 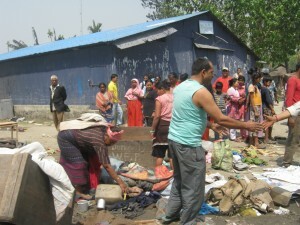 To read about Bhutanese refugees in more detail, please click here. 805 million people worldwide do not have enough food to eat. Food banks are especially important in providing food for people that can’t afford it themselves. In 1998, the UN estimated that it would take $40 billion annually to offer basic education, clean water and sanitation, reproductive health, and basic health and nutrition to every person in every developing country. That would be about $58 billion today. YOU’RE ONE OF THE RICHEST PEOPLE IN THE WORLD. YOU. And the disparity between the rich and the poor continues to grow. You are rich. It’s all perspective, and a humbling realization. You are rich, but first and foremost be rich in spirit and mind. Give to others when you can and that will come back to you exponentially – in so many ways you cannot imagine!